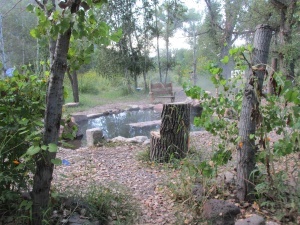 Gila Hot Springs Campground is a private business owned by Allen and Carla Campbell. It offers camping and natural hot spring pools beside the Gila River in southwest New Mexico. We are located 40 miles north of Silver City and about 4 miles from the Gila Cliff Dwellings National Monument. Our area is surrounded by the Gila Wilderness and the larger Gila National Forest. 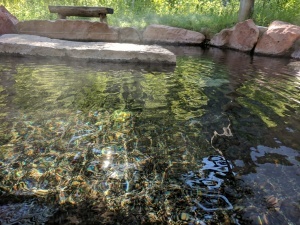 The hot springs bubble out of rocks on property owned by the Campbell family. The springs vary in temperatures from 147 to 154 degrees F. and are considered sweet springs (no sulfur odor). These springs have been used by the Campbell family since the 1940s. Other local businesses are Doc Campbell’s Post, an interesting country store, and the Gila Hot Springs Ranch and RV park. These two businesses are separate from our Campground and have their own websites (see links above) with contact information. Silver City, known as the “Gateway to the Gila Wilderness”, is the closest town of any size. 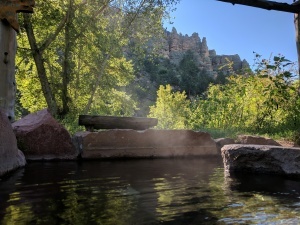 Travel time from Silver City to the Gila Hot Springs is about an hour and 20 minutes on Highway 15. More about Silver City, NM. The best way to make reservations is to press the green button at the bottom of the pages. It is quick and easy to fill out, and you will get an auto-reply on your e-mail within a short time. We answer Requests early in the mornings and evenings, so please be patient. Phone calls go to our answering machine most the time. The best time to call is from 7:30 to 8:30 and 12: 00 noon if you do not have e-mail. Please, no calls in the late evening. It has finally warmed up, and the Spring season is starting Reservations are advisable if you have specific camps you want to request, or for weekends when we may fill up. Also, we had good snowfall this winter and the spring runoff is starting. We have a good launch-site at the north end of our Campground. Limited parking, other sites can be arranged. Enjoy the hot water before you get into the cold stuff! Our business has increased to the point where it is a good idea to contact us for reservations.